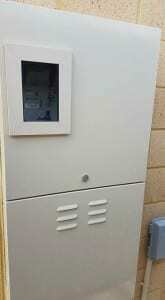 Make your Meter Box tamper proof and stop unauthorised people switching off your mains power or removing the fuses. Generally if the power to your home is interrupted ,you will have No phone, No computer or No security system. Prevent this happening to you today by having a Beards Security viewing window and an approved meter box lock fitted. A lockable Western Power meter box also gives greater peace of mind to any electrician who may need to access and switch off the power to your place whilst they are working on your home or premises. Our viewing windows are manufactured using weather proof security frame and are fitted to prevent unauthorised removal . They are available in most colours to suit your meter box.